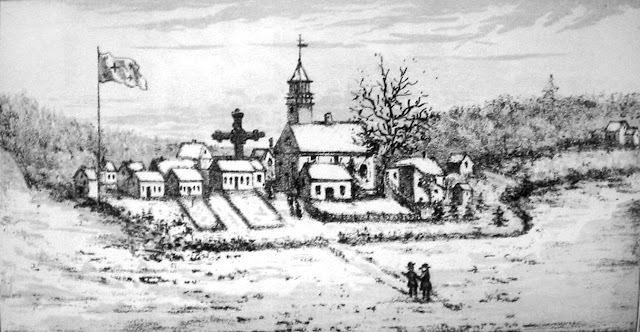 Odanak in the mid-1800s. From an illustration in Eugene Vetromile's "Ahiamihewintuhangan, the prayer song" published in 1858. This marvelous collaboration between the Studio de musique ancienne de Montréal and the Abenaki elder Thérèse O'Bomsawin Gaudet, who supervised the pronunciation, is an excellent example of inculturation done right and to a high level of artistic excellence. Canadian readers might also be interested in hearing a plainchant piece from this session: Sacrae Familiae, the sequence (prose) for the feast of the Holy Family. Composed in Quebec and sung liturgically there for centuries, Sacrae Familiae was not included in the propers when the feast was extended throughout the Latin Church, so it remains unique to the use of Quebec. This sequence can be found in numerous 19th-century Graduals from the diocese as well as parish-books from the nearby Indian missions.